Colombian volcano Nevado del Huila remains at the second-highest level of Orange, ‘eruption likely within the next few days or weeks’. … during the evening, localized collapses of the dome towards its western sector [were observed], which generated small pyroclastic flows and incandescence, both limited to the upper part of the volcano, without compromising, for the moment, the Páez river. 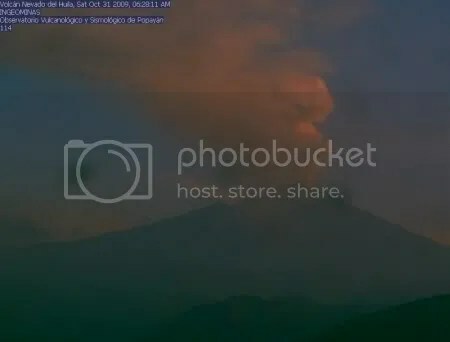 The first occurred on 28 October at 02:00 (07:00 UTC); according to a VAAC report a column of 4 km altitude was observed from the summit of the volcano. The second pulse was recorded in the early morning today, at 02:54 (07:54 UTC). This event was associated with an acoustic signal reported by local inhabitants, and ash fall in Inzá, Mosoco, Jambaló and Belalcázar, to the south-west of the volcano. The VAAC report for this event shows a column which reached an altitude of 7 km above the summit of the volcano and that dispersed mainly towards the south-west. Through the Nevado del Huila webcam ‘intense degasification of the system with pulsing escape of ash at the surface’ has been observed. The overflights of 30 October and 2 November monitored the growth of the new lava dome which has developed on top of the dome constructed in November 2008: ‘the volume of the new dome extruded at the surface is estimated to be about nine million cubic metres’. 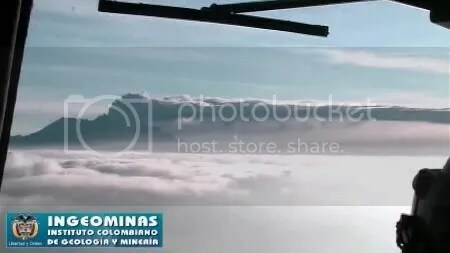 There was another overflight of Nevado del Huila volcano on 29 October, reports the Observatorio Popayán in its latest special bulletin, issued late yesterday. Among the observations reported is that the new material seen in the overflight of last Friday has been confirmed to be a new dome constructed on top of the existing dome: ‘It is stressed that the new dome has a high growth rate’. Continuous and intensive degassing was in progress, with the centres of gas emission corresponding to the position of the new dome. Posted by admin in Colombia, NASA Earth Observatory, Nevado del Huila. 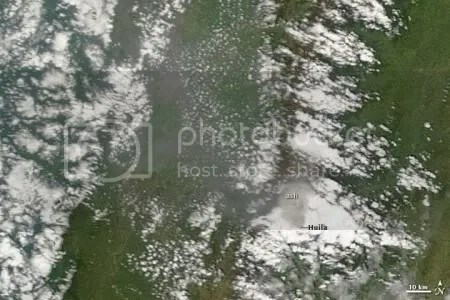 Yesterday NASA’s Terra satellite passed over Nevado del Huila volcano in Colombia and captured this MODIS image which has just been speedily published by the NASA Earth Observatory. Grey ash emissions can be seen rising from the volcano’s summit and dispersing to the north-west. The image is accompanied by an informative caption by Robert Simmon giving the background on Huila’s recent activity (and referencing this blog, which is much appreciated). 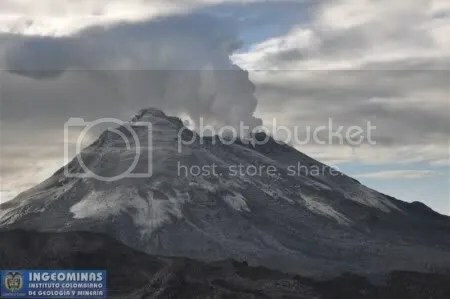 The Colombian state geological service INGEOMINAS has published an overview of activity at Nevado del Huila volcano over the last few restless days: Reporte de actividad volcán Nevado del Huila, 27 oct 2009, available at the Observatorio Popayán website. Translation as follows. The level of activity at the volcano continues at LEVEL ORANGE (II): ERUPTION PROBABLE WITHIN DAYS OR WEEKS. – In the present week a total of 1004 seismic events have been recorded: 119 related to the fracturing of rock, 847 to fluid dynamics within the volcanic conduits, 13 were hybrid type events and 25 were pulses of tremor associated with the escape of gases and ash to the surface. – During the week various pulses of spasmodic tremor associated with the escape of gases and ash to the surface were recorded, particularly those occuring on Friday 23 October at 04:35 (09:35 UTC) and Saturday 24 October at 12:10 (17:10 UTC). Related to these events, reports of ash fall were received from several municipalities in Cauca, Huila and Valle de Cauca. Similarly, a sulphur smell has been reported by passengers on commercial flights and residents of towns around the volcano. 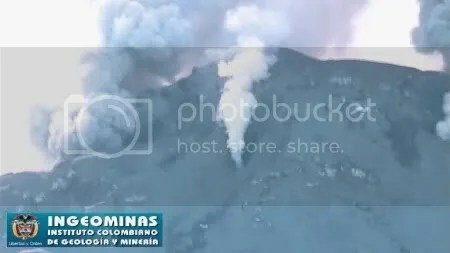 – In an overflight carried out by observatory personnel on Friday 23 October with the support of the Colombian Air Force the volcanic edifice was seen to be completely covered with ash, two principal focuses of emission of gases and ash on the surface were seen, located in the upper part of Pico Central, and the extrusion of new magmatic material was visible towards the surface in the extreme north of the dome constructed in November 2008. – In images captured via the webcam during the week, intense degasification of the system with pulsating emission of ashes at the surface was observed. The directions of the columns fluctuated in accordance with the prevailing winds in the area. 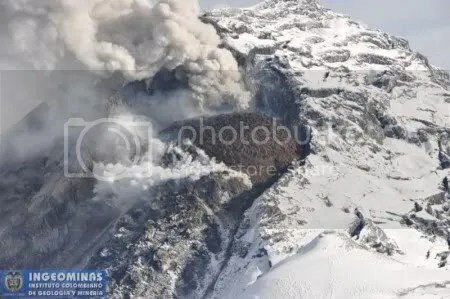 In the same way, the VAAC has issued eight reports of sightings through satellite imagery that show columns of ash up to 5000 metres altitude over the summit of the volcano. – The images captured by the AURA-OMI satellite and published by the NOAA allow observation of the continuing discharge of SO2 during 21, 22, 23, 25 and 26 October, with a maximum of 7793 tonnes/day recorded on Monday 26 October. These images match up with the record of continuous tremor observed during the week. – On Monday 26 October SO2 was measured through the MovilDOAS system between the town of Miranda (Cauca) and the city of Popayán. An SO2 flow of 3766 tonnes/day was calculated, with dispersion towards the south-west of the volcano. In measurements of SO2 carried out by the ScanDOAS station in the city of Cali those of today stand out, in which the flow is calculated at 4551 tonnes/day in a column dispersed towards the north-west of the volcano. – Because of the foregoing, it is concluded that the volcanic system continues to show unstable behaviour, with a predominance of processes associated with fluid dynamics, which involve the escape of ash and gases to the surface. For this reason, it is recommended that particular attention is paid to the evolution of the current phenomena, because of the possibility of movement towards a state of higher activity. INGEOMINAS will continue to monitor and report in a timely manner on any changes that may take place. Nevado del Huila volcano in Colombia is continuing to produce a steam plume with varying amounts of ash on a continuous basis. 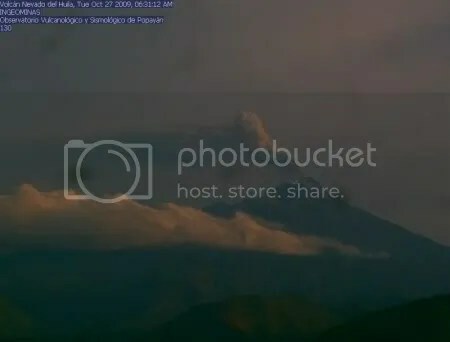 The image above, captured from the Nevado del Huila webcam at 06:31 local time (12:31 GMT) this morning, shows vigorous emissions rising from the volcano and a plume, which looks to contain significant ash, blowing away to the west. The latest Huila ash advisory from Washington VAAC, released at 12:26 GMT, reported the plume extending westwards for 20 nautical miles (~37 km). The image above is a reduction of the original webcam image, which is a generous 800 x 608 pixels. The full-size detail view below shows the volcano summit. The webcam looks northwards: the main active emission area is around the lava dome, which is on the south face of Pico Central, the volcano’s highest point, although there are also emissions from a crack on the north face of Pico Central. Images from the overflight of 23 October show the summit in more detail. Two principal foci of gas and ash emission at the surface were observed, located in the topmost part of Pico Central, the larger located between Pico Central and the upper part of the dome and the other located to the northwest of Pico Central, above the fissure generated in April 2007. It is evident that there is extrusion of new magmatic material towards the surface in the extreme north of the dome constructed in November 2008 (western side), the extruded body presents a thermal anomaly observable through the FLIR camera. The volcano is completely covered with ash because of the constant emissions taking place over recent days. The report concludes by warning that Nevado del Huila ‘continues to display unstable behaviour’ and urging communities around the volcano to pay close attention to INGEOMINAS bulletins. The alert level for Huila remains at the second-highest level of Orange (Naranja), ‘eruption probable within days or weeks’. UPDATE. Washington VAAC has reported an eruption of Nevado del Huila at 17:10 UTC today which produced an ash plume to FL300 (30000 feet/9000 metres). The INGEOMINAS Observatorio Popayán, which monitors Nevado del Huila volcano, issued a bulletin yesterday which reported ‘a decrease in the continuous tremor which has been registered since the evening of Friday 16 October’ and ‘a significant increase in long-period (LP) seismicity, possibly associated with the ascent of magmatic material to shallower levels’. 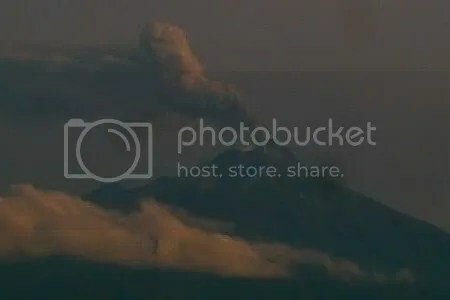 The continuous emission of gases and the ‘pulsed output’ of ash from the volcano has been observed through the webcam. The alert level for Nevado del Huila remains at Orange (Naranja), ‘eruption probable within days or weeks’, and INGEOMINAS is warning local communities to be ready for any increase in the volcano’s activity. Ashfall from the current activity at Nevado del Huila is causing problems in communities around the volcano. The local newspaper for Popayán, El Liberal, reports that ‘people living in the affected municipalities are concerned about the ash and the smells produced by the changes in the volcano’s behaviour’, and one municipality (Jambaló) has requested scientific analysis of its water supplies, which it is feared may have been contaminated by the ash. 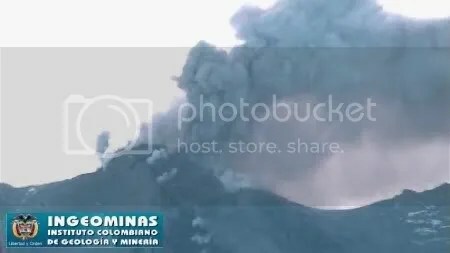 Posted by admin in activity reports, Colombia, eruptions, Nevado del Huila. Further to yesterday’s reports of activity at Nevado del Huila, the Observatorio Popayán, which monitors the volcano, has issued a new bulletin reporting that ‘continuous tremor has been registered since the evening of Friday 16 October at 19:55 (00:55 17 October UTC). This seismic signal is associated with the continuous emission of ashes and gas at the surface’. Ashfall and sulphur smells were reported yesterday in areas surrounding the volcano. Webcam images showed ‘intense degassing of the system with pulsing emissions at the surface’. Emissions of sulphur dioxide have been high, with 4532 tonnes/day recorded on 17 October. The bulletin concludes that the volcano ‘is in a state of continuous activity, with a predominance of processes associated with fluid dynamics involving the output of ash and gases to the surface’, and warns that this situation ‘has the potential to evolve into higher states of activity’. 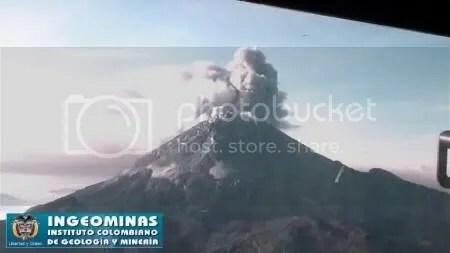 The Popayán newspaper El Liberal reports today that ‘Corinto, Caloto, Buenos Aires, Toribío, Piendamó, Belalcázar, Jambaló and Miranda municipalities have been affected by the ash emitted by Nevado del Huila’. Roofs, crops and animals were all covered by ash: ‘Although people are carrying on with their daily lives the ash and smell have caused havoc and discomfort, particularly in the north-west of Páez where there are children with red eyes, coughing and headaches because of the volcano’, says one Belalcázar resident quoted in the report. The Mayor of Páez is appealing for 12000 face masks to be provided for people living in the worst-affected areas. The alert level for Nevado del Huila remains at the second-highest level of Orange (Naranja), ‘eruption probable within days or weeks’.